American brilliant cut glass has a dirty, little secret. During the early years of the twentieth century, purchasers of cut glass were sometimes sold glass that had been cut on so-called “figured” blanks. (“Blank” is the name given to an uncut piece of glass.) On these blanks part of an object’s pattern was “pre-formed,” not cut; therefore, many people — then and now — did not and do not consider that such items are genuine cut glass. Made yesterday, they exist today in quantity to tempt the unwary collector. A look at this somewhat cynical attempt by certain cut-glass manufacturers to increase their sales should help the collector define the role, if any, “figured” blanks might have in his or her own collection (note 1). The demand for cut glass in this country is said to have peaked between 1905 and 1910 (Spillman 1996, p. 12). During these years, cut glass companies, large and small, were thick on the ground and competition was intense. A company that had an economic advantage might survive; one that had none was likely to fail. An obvious solution was to increase the demand for cut glass. But to do this it was necessary to sell cut glass to a population that heretofore could not afford it. For, up to this time, cut glass was purchased almost entirely by the upper and upper-middle classes. If it were possible to lower the cost of cut glass to the public in general, it was felt that the as-yet untapped lower economic levels might begin to buy the product. In a labor-intensive enterprise such as cut glass, one obvious way to manufacture a cheaper product is to decrease the number of man-hours spent in manufacturing it. Other methods of saving were probably also examined, but the cost of labor seemed to be the major factor. In this context, “figured” blanks — where the major features of the pattern were already present — greatly reduced the amount of cutting that was required. Wilson (1994, p. 642) reports that this resulted in reducing production costs by as much as 40%. This must have been seen as something of a life-saver, particularly to companies that were in fragile economic health. J. Michael Pearson (1975, Vol. 1, p. 51), who first discussed this particular pattern of interlocking circles, noted its widespread use and believed it to be a case of plagiarism. Today most investigators would not apply so harsh a judgment to the companies involved. Apparently they had merely shared a blank that was provided to all who wished to purchase it, but to confirm this it is necessary to compare items of identical size and shape for each company — a difficult, if not impossible, task to accomplish today, so many years after the fact. It is interesting to quote some opinions authorities have expressed regarding “figured” blanks. Dorothy Daniel (1950, p. 38) was probably the first modern writer to discuss this situation. She concluded that such cut glass “should probably not be included in a collection of fine cut glass because in a way it is an imitation, the product of a short cut.” Fifteen years later the Pearsons (1965, p.25) were unequivocal in their opinion: “Glass cut on pressed [i.e. “figured”] blanks should be avoided.” Revi (1965, p. 15) took a larger view: “The use of pressed or figured blanks was one of the contributing factors to the decline of the cut glass business in America.” (Note that the Pearsons and Revi incorrectly equate pressed and “figured” blanks. A pressed blank may or may not be “figured” (note 3). Here, for example, is a “plain blank” ready for decoration in the Hawkes workshop. A detail of the contemplated design is the heavy, deep miter or V-shaped incisions common to most cut glass pieces. When these miters are cut on a “plain blank,” refraction is produced almost equal to that of the diamond. When, however, the design has been pressed into the “blank,” refraction is interfered with by the resulting undulations which occur on the interior of the blank (consequent upon the glass being in a molten, impressionable state when “pressed”). The prismatic effect is thus practically neutralized; the color is clouded; the sparkle subdued. Hawkes Glass, made always from the “plain blank” transmits a perfectly colorless and extremely brilliant light. “Cut Glass” made from “figured blanks” is as unlike Hawkes as any hurried reproduction strays from the beauty of a fine original. To detect the “figured blank” makeshift is beautifully simple: run the fingers over the inside of any casual piece of “cut glass.” Where the cutting on the outside is deepest, a slight swelling on the inside will be noticeable to the touch. Should the purchaser be puzzled, let him ask the dealer to guarantee the article to be cut from the “plain blank” (note 5). The Hawkes booklet does not mention a method used to detect a “figured” blank that some people might find easier and more reliable than running one’s finger tips around, say, the inside of a bowl. Take the bowl in question in both hands and tip it so that it catches a light source that is behind you (a window, for example). The image of this light source will be seen on the inside of the bowl. Then tip the bowl so that the image travels across the inside of the bowl. If it appears to “jump” across certain cuts, for example the major miter cuts, than the blank is “figured.” This technique works well with all open items but care should be taken when testing flat pieces to distinguish between naturally occurring undulations and impressed “cuts.” With practice you can walk by a display case and observe “travelling” reflections that indicate “figured” blanks. And you will not have to disturb the sales person! The image above, on the right, captures an especially distinct reflection as it crosses (“jumps across”) a pre-formed miter cut. There is no limit as to the type of object that can be “figured.” However, probably the most frequently encountered objects are berry bowls, sugars and creamers, celery trays, ice cream trays, and plates, followed by compotes and vases. It paid the manufacturer to have “figured” molds made for only the more popular items. Another major cut-glass manufacturer that used “figured” blanks was J. Hoare & Company. Apparently this company enthusiastically embraced these blanks in the years around 1910. A number of “figured” catalog patterns have been found and they are often signed. As the collector becomes familiar with “figured” blanks, he will begin to recognize the characteristics mentioned in the Hawkes booklet. But he should also be aware that these blanks can sometimes be attractive. The “figured” blanks used by the Elmira Cut Glass Company, for example, are often quite good and can be compared favorably — in overall appearance — to the “plain” blanks that this company also used. Given the nature of “figured” blanks one wonders — along with Dorothy Daniel — whether any should be included in a collection of fine cut glass. The present writer feels that perhaps only one or two such articles should be retained in a collection, where it can be justified as a “demonstration” piece, providing a ready comparison between imitation and genuine cut glass. The casual collector has all-too-many opportunities to purchase the “faked” product. These occasions are discussed elsewhere. Here it is only necessary to point out that serious dealers, mindful of their reputations, usually will not purchase or advertise for sale “figured” cut glass. Other sellers are less particular. It should be noted, however, that many of them are poorly informed and are completely unaware that they are selling a product that is not genuine. While it is difficult to give price guidance for an article cut on a “figured” blank, it is sometimes suggested that it be evaluated at about 50% of the value the article would have if not “figured.” The potential seller should realize, however, that even this “deep discount” is probably not large enough to prompt a purchase by a knowledgeable buyer. In some respects this situation is analogous to silver plate and sterling silver. In the case of silver, the manufacturing techniques used are well known, and, as a result, quality and price in the marketplace are closely related. In the somewhat secret world of “figured” cut glass, however, the buyer is usually uninformed regarding the technique used and, therefore, can easily be misled and short-changed. 1. Sometimes the terms “figured” blank and pressed blank are incorrectly used interchangeably. In this file “figured” always refers to a pattern that has been pre-formed (not cut) by blowing or pressing a gather of molten glass in a patterned mold. A pressed blank can be either “figured” or plain. 3. Contact with mold and plunger dulled the exterior and interior surfaces of the pressed blank. Usually the blank would then be fire-polished. That is, it would be exposed to temperatures slightly below the melting-point of glass. This would restore the original glossy surfaces, making it difficult to identify these pressed blanks today. A good example of a pressed blank that can easily be identified is a cut-glass dish, sometimes called a caboret, that has integral glass dividers in its interior. It can be found cut on a plain blank as well as on a “figured” one. A Precursor to the American-Made “Figured” Blank? 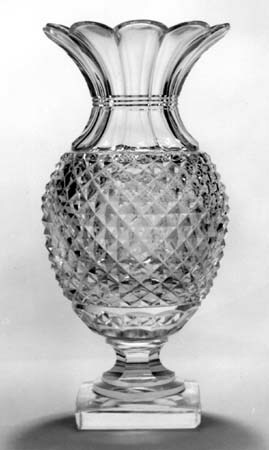 One of a pair of so-called mantle vases (the other vase no longer exists) is pictured below. It was blown into a patterned mold that contained both the fluted top and the ovoid body. The latter’s pattern of sharp diamonds was then overcut (“touched up”) at the wheel. No mold-seams are visible. The vase has an applied, flute-cut short pedestal and an applied, square foot with mitered (cut) edges. The bottom of the vase is ground flat and polished and has no pontil. (The photo shows reflections.) The “watery effect,” produced by the patterned blank where it is thinnest, can just be discerned in the extreme upper right-hand portion of the band of sharp diamonds. The accompanying interior irregularities can easily be felt, as can the irregularities that correspond to the molded flutes. The lead metal has a slight, greyish tint. The date and origin of this vase have yet to be determined. Its style suggests the mid-nineteenth century, and it may be an example of molded glassware produced in England at this time. Elville (1953, p. 73) mentions that this procedure made it possible “to supply the cutter with an indented outline of the pattern he was required to cut, thus saving him the operations of marking and roughing, and that this procedure resulted in “a great saving in time and wages.” Elville also comments that American glass of this period (which is now called mold-blown or blown-three-mold) was not overcut, “with a few exceptions.” This American product consisted of “almost exact copies of some current England and Irish designs, but there was no pretense made to pass off such articles as cut.” Elville should have visited the American cut-glass scene at the beginning of the twentieth century when he would have been introduced to the “figured” blank. It would have been familiar to him! H = 10″ (25.4 cm), rim D = 5″ (12.7 cm), foot L = 3″ (8.3 cm) on a side, wt = 4 lb (1.8 kg). Sold for $25 in 1993.